Please note that for the immediate future, I will not be accepting any new hand saw sharpening jobs due to competing priorities. If you have already sent me a hand saw for sharpening, I will be completing your order within the time frame that was originally promised. However, I will not be accepting any more saws for service until further notice. Thank you for your past business!!! Descriptions of standard hand saw sharpening and restoration services are listed below as a guideline for you to approximate the cost to have your saw reconditioned. However, you may find it best to contact me before sending your saw out for service so that we can discuss what your personal needs are. Based upon the condition of your saw, your experience using hand saws, the type of woodworking that you do, the intended use of the saw, the types of woods that you most frequently use, and your expectations from the saw, I'll make sure your saw is set up just right for you. After reviewing the prices and descriptions for the different services below, please contact me to get the process started. Please note, the prices below do NOT include shipping the saw to me, OR the return shipping. After service has been completed, I'll provide a PayPal invoice for the total cost of the services and the return shipping. At that time, payment may be made by credit card or by check. If you would prefer, you may include the check in the box with the saw if it is more convenient for you (though this is not required). If paying by check, please include the return shipping cost in the total amount. This service is for saws that only need a light touch up sharpening and do not require reshaping and evening of the existing teeth. The existing rake and fleam angles will be maintained, and set will only be adjusted if the the saw is not cutting correctly after sharpening. This service is most appropriate for newer saws that have simply dulled from use, and the rare antique saw that was put away in good condition but does not have any damage or unevenness to the teeth. Please note, most antique saws will require more work than this service provides (see the Reshaping & Sharpening service below). All sharpening is done by hand with properly sized tapered saw files. This service begins with jointing the tooth line to ensure that it is straight or properly breasted, as appropriate. After the toothline is properly jointed, the teeth are filed to the appropriate rake and fleam angles, consistent with the intended use of the saw, experience of the sawyer, types of wood being sawn, and desired aggressiveness. Uneven tooth spacing is also adjusted during the reshaping process. The teeth are then set, if necessary, to provide an adequate kerf to prevent the saw blade from binding in the cut. 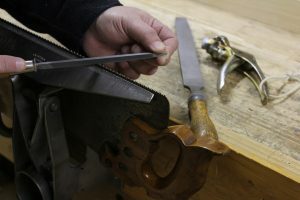 After setting, the teeth are re-jointed, sharpened to their final edge, and the saw is tested and adjusted for a perfect cut. All of this work is done by hand with properly sized tapered saw files. If the teeth on your saw are severely mis-spaced with teeth of varying sizes all along the tooth line, if the tooth line is wavy or severely concave instead of straight or breasted, or if there are many broken and missing teeth, your saw will likely require retoothing. Alternatively, if the teeth on your saw are spaced just fine at say 12 points per inch, but you'd like the saw to have 16 points per inch, I can retooth your saw for you to the requested tooth spacing. Retoothing consists of removing all of the existing teeth on the saw and then filing in new teeth at the desired spacing. This is done by hand, with a tapered saw file (I don't use retoothing machines). This service also includes the jointing, shaping, setting and sharpening work required to return the saw to service. Frequently, because a saw was dropped by a previous owner, or because a previous user kinked it during use (usually the result of trying to force a dull saw through a cut faster than it is capable of cutting), a saw may have bends or kinks in the blade. Bends in backsaws were often improperly fixed by a previous owner who just hammered the back lower onto the blade, giving the blade a tapered appearance. Using a hammer and anvil, these kinks can usually be removed. In the case of backsaws, the back is removed, the blade is straightened and the back is reinstalled. Severely kinked saws may not be able to be fully straightened without doing permanent damage to the saw blade, so it's best to check with me before sending kinked saws for service. Rust on a saw blade makes for a dirty cut, a saw that sticks in the kerf, and teeth that just won't get as sharp as they can be. For a saw to perform at its best, the blade should be clean, free of rust, and smooth. My cleaning process starts with a soak in a rust remover to remove heavy corrosion. I follow this up by removing the loosened crud and rust with various grits of sandpaper, steel wool and a light oil. The toothline is given special attention to ensure that the teeth are clean and able to take a fine edge. After cleaning off the residual grime and oil, I finish up with a protective wax polish. I'm happy to clean your saw for you, but it's a simple job that you can easily do and save yourself $50. Old saw handles are frequently found with broken horns or cracks in the cheeks from being dropped or from over tightening of the saw bolts. Cracked cheeks can prevent the saw from being held securely in the handle, making for a wobbly grip. Broken horns can be down right uncomfortable if they're broken in a way that interferes with your natural grip on the saw. Often, if the damage isn't too severe, it can be repaired. Cracks can be glued and horns can be repaired by scarfing on patches and shaping them to blend with the original handle. The original handle finish color can usually be closely matched to hide the repair as much as possible, or the entire handle can be refinished. Saw bolts can also be cleaned and polished upon request. If you have a saw with a handle that is beyond repair, or if you'd just like a special handle for your saw, I can make and fit a new handle to your saw. I can make a handle to match the original handle that came with the saw or I can give the saw a new look with a different style handle. Standard woods that are always available for replacement handles are walnut, cherry, and maple. If you have a special piece of wood you would like me to use for the handle, I can use that as well. The standard finish for new handles is an oil/varnish blend with a wax polish.